The first steps towards interstellar travel have been taken, but the stars are very far away. Voyager 1 is about 17 light-hours distant from Earth and is traveling with a velocity of 0.006 percent of light speed, meaning it will take about 17,000 years to travel one light-year. Fortunately, the elusive “warp drive” now appears to be evolving past difficulties with new theoretical advances and a NASA test rig under development to measure artificially generated warping of space-time. The warp effect uses gravitational effects to compress the spacetime in front of a spacecraft, then expand the spacetime behind it. 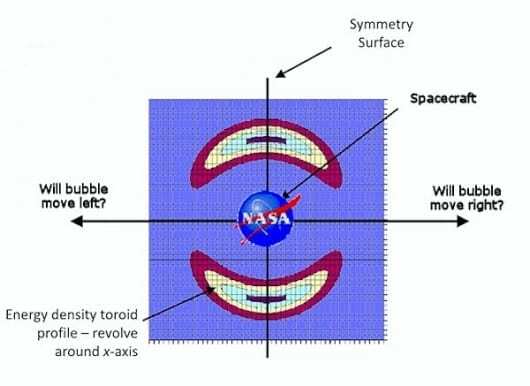 The bit of spacetime within the warp bubble is flat, so that the spacecraft would float at zero-g along the wave of compressed and expanded spacetime. The net effect is rather like surfing, where you are nearly stationary with respect to the wave, but are traveling with the speed of the wave. Whereas many of the theoretical studies consider a warp bubble moving at ten times the speed of light, there is no known limit to the potential speed. Such a warp bubble could in principle be used to enable subluminal travel (travel slower than light) as well as superluminal travel (travel faster than light). This may seem a silly choice – why travel slow rather than fast? However, it is likely to turn out far easier to achieve a subluminal warp drive for a number of fundamental reasons. Besides, space travel at 90 percent of the speed of light is far superior to anything we currently have on the books. This sounds too easy, and in many ways, it is. Thus far, all superluminal warp drives require negative energy and pressure to form and maintain the warp bubble. Matter consistent with such properties does not exist in classical physics. While in quantum mechanics there are certain possibilities for negative energy phenomena, they generally do not seem well suited to generate the required warp bubble. An additional problem is that a great deal of negative energy is required to initiate a warp bubble. For Alcubierre’s original model, it would take more negative energy than the total mass of the Universe to equip a small spacecraft to travel at ten times light speed. Fortunately, refinements to the model have resulted in the energy requirements reducing to the mass equivalent of a few hundred kilograms of matter with negative energy. Mind you, we don’t know how to get that quantity either, but it feels a more likely prospect. Matter with negative energy and negative pressure is usually called exotic matter, and we don’t know of any. However, another possibility is to use dark energy to expand spacetime – after all, that is how we know dark energy exists, through observing the accelerated expansion of the Universe. Although nearly three-quarters of the mass-energy of the Universe is dark energy, it is spread thinly, at the equivalent of about ten hydrogen atoms for every liter of space. Given this, harnessing dark energy for warp drives might seem an overwhelming task. That doesn’t mean it’s impossible however. To put this into perspective, consider magnetism. The interstellar magnetic field is about a nanoTesla, or about one-fifty thousandth of the Earth’s field. If this is all we knew of, harnessing magnetism for any practical purpose would seem unlikely. However, a tiny rare earth magnet exhibits magnetic fields 100 million times stronger than the interstellar field. It isn’t wise to recklessly eliminate possibilities.